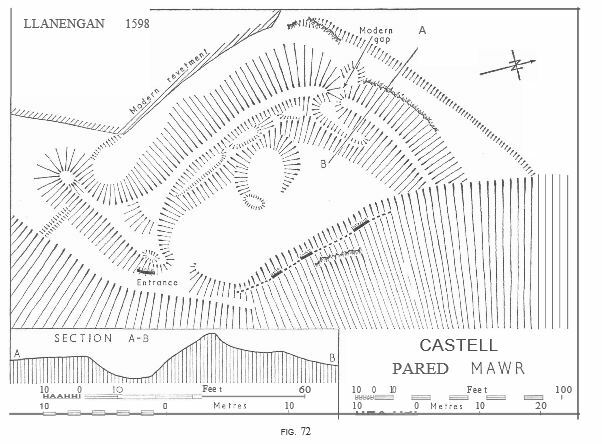 A small cliff-,fort on the edge of Pared Mawr (Fig. 72) overlooking Porth Ceiriad. The fort stands on level ground at 300 ft. above G.D., in a superb situation at the cliff’s edge. The enclosed area is roughly rectangular, measuring about 130 ft. within the defences from N. to S., and 70 ft. in width. 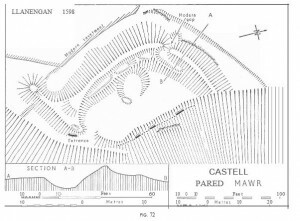 The ground within falls gently to the E. The defences consist of a bank round the whole enclosure, accompanied on N. and W. by a ditch. The bank is most strongly developed on the N., where it reaches a maximum thickness of 42 ft. at the base and heights of 6 ft. internally and 12 ft. above the bottom of the ditch externally; on the W., owing to a fall in the level of the ditch, the external height is even greater, up to 15 ft. No facing is visible on these sides, but along the inner side of the bank, both on the N. and W., ill-defined platforms or hollows have been scooped out to form a terrace about 3-5 ft. below the top of the rampart. These are almost certainly due to the removal of stone in recent times.1 The rampart also continues round the S. end of the fort, but is there much diminished in size to a stony bank about 10 ft. wide at the base by 3 ft. high. Midway along the short S. side a gap 12 ft. wide appears to be original and leads out on to a narrow ledge above the precipice, leading away to the W. From the S. W. corner of the fort a spur bank leads off to the W. along the upper side of this ledge for a total distance of 45 ft., terminating in a bastion 18 ft. wide at the base and 5 ft. high. This spur cuts off the seaward end of the ditch. The rampart also continued along the crest of the E. side, on the edge of the cliff, but has now almost disappeared (piles of stones can be seen in a hollow in the hillside some way below). Its former existence is clear from the presence of a line of outer facing stones (base course only) along a good part of the E. side. These lie on the steep slope about 7 ft. out from the edge and 6 ft. below it. The inner face was presumably along the lip of the drop, so that when standing the outer face must have been at least 6 ft. high. The ditch along the N. and W. sides is U-shaped, immediately outside the rampart, about 30 ft. wide at the top and 12 ft. wide at the bottom. Along the N. side its lower part is cut in the rock. It has a maximum depth of 6 ft. below the ground level outside the fort. Inside the fort the only visible structure is a round hut about half-way along the W. side. This is marked by a low grassy bank and is about 22 ft. in diameter. Its entrance appears to have been on the E’. 1 – Arch. Camb., 1903, p.252, s.v. ‘Castell Yscuborhin’; and letter dated 1926 in Commission’s files.